"I hate when you're trying to read something and you come across the expression 'one thing led to another'. What in the hell kind of lazy writing is that? Isn't it your job as the writer to tell me how 'this' led to 'that'?" Reviewing standup comedy is something of a challenge, because if I just spell out all the gags you won't need to see it. It would be easy to rattle of the bits, as there often isn't much else to comment on without delving into the content. I'll do my best to dance around the particulars and still give you the flavor. Plus, I consider Brian Regan a funny guy, so I don't want to step all over his act. 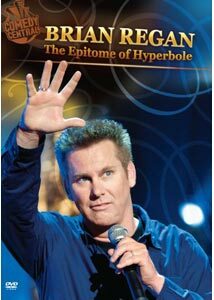 Brian Regan: The Epitome of Hyperbole is a Comedy Central special recorded in 2008 at the Paramount in Denver, and the title is a reference to someone who had complained to Regan he wasn't pronouncing any of his words correctly; naturally Regan purposely mangles "eppy tome" and "hyper bowl." Regan is kind of rarity, in that he's a successful standup that doesn't need to work blue to get laughs, often relying on weird, rubbery facial expressions to sell the humor. For this disc he appears slightly less manic than I've seen him in the past, yet he still delivers a compact 42-minute set divvied up into seven main sections, looking at reading, movies/parties, art/language, law, television, space, and marriage. There's nothing particularly daring about Regan's choice of subjects, though he bounds through the material with an appealing energy level, never shy about punctuating a potentially simplistic bit with one of his goofy facial expressions. When he's analyzing why books have the title on every page, he sells it well with some funny gestures, which builds to a variation after wondering why movies don't have the title at the top of the screen. His act is mishmash of observational style comedy�taking on cooking shows and stupid husbands�as well as a Carlin-esque look at certain words and phrases, such as "manslaughter" and "no-nonsense judge." When he offers up the unused line he claims he wrote for The Planet Of The Apes ("Man, these bananas are good!") it's a dumb throwaway, but it's presented so quickly that there isn't time to groan because Regan is then bounding off on another loosely related tangent. This is a very enjoyable set from a comic who has polished a strong 42 minutes, and darn if it isn't funny. I tried to not spill all the punchlines for you, so you're welcome. Image Transfer Review: Presented in 1.78:1 anamorphic widescreen, this Paramount release looks quite excellent on all counts. Just an all-out solid effort here, as image details and edges are sharp, while colors are consistently bright. Audio Transfer Review: Audio choices are 5.1 surround or 2.0 stereo. No knock on the average joe quality of the stereo track, but the 5.1 mix has a terrific live feel to it. The rear channels carry audience laughter and crowd sounds, and the presentation has a very deep soundstage. Regan's delivery is crystal clear on either audio track, but the 5.1 really gives a "you are there" vibe. Extras Review: Extras consist of The Encore (03m:54s), which apparently, for timing reasons, wasn't part of the broadcast version. Here it's tacked on as bonus material, with Regan doing nice bits on Dora the Explorer and walkie-talkies. The Backstage Story (13m:39s) has Regan answering questions about his approach to comedy, intercut with crews getting ready for the show. The disc is cut into 10 chapters. The merits of the rewatchability of a standup comedy disc is something you'll have to decide, but as a rental, this is an easy recommendation. At just 42 minutes it's a fairly tight set by Regan, one that even manages to be pretty clean on top of it. Impressive audio/video transfers from Paramount, too.